I've mentioned in the past couple recipe posts that I am finally cooking my way through some of the cookbooks that John and I received as wedding gifts. One of my favorites so far has been Ina Garten's Barefoot Contessa Back to Basics. Firstly, I wish Ina was my best friend, and secondly, her arugula pizza is amazing. 1. To make the crust, combine the first four ingredients and mix until the yeast is dissolved. Add the flour and salt and mix until a soft dough is formed. Add up to an extra cup of flour if the dough is sticky. Cover the bowl and let rise for 30 minutes. 2. For the sauce, combine the olive oil, garlic, thyme, and red pepper flakes in a sauce pan and bring to a simmer over low heat. 3. Once the dough has finished rising, form your crusts on a baking sheet. 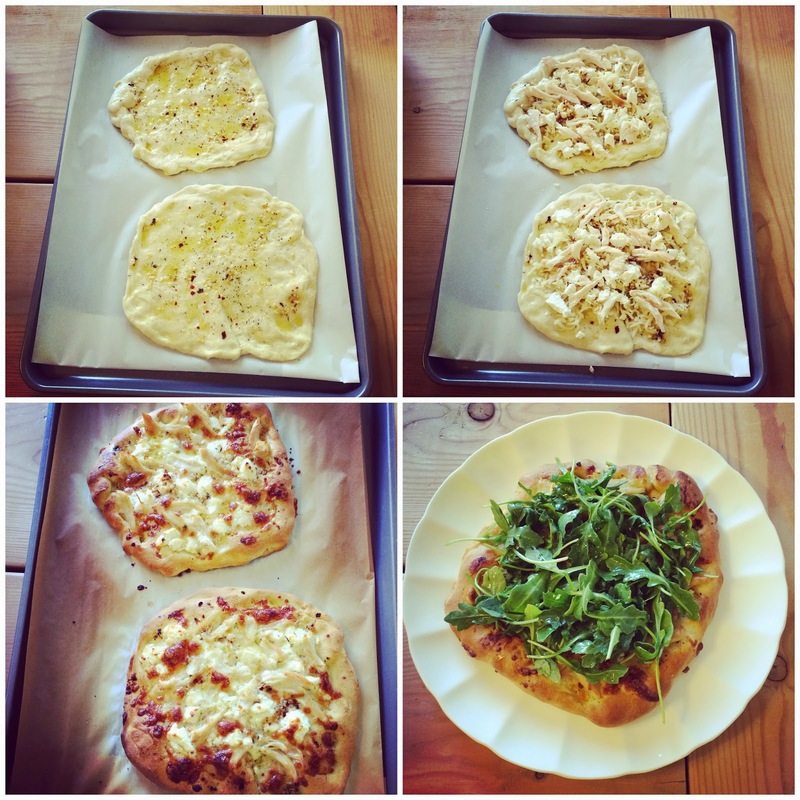 I made 6 small personal-sized pizzas, or you could make 2 large pizzas. Top the pizza with the garlic sauce and cheese. Bake at 500 degrees for 10-15 minutes. 4. 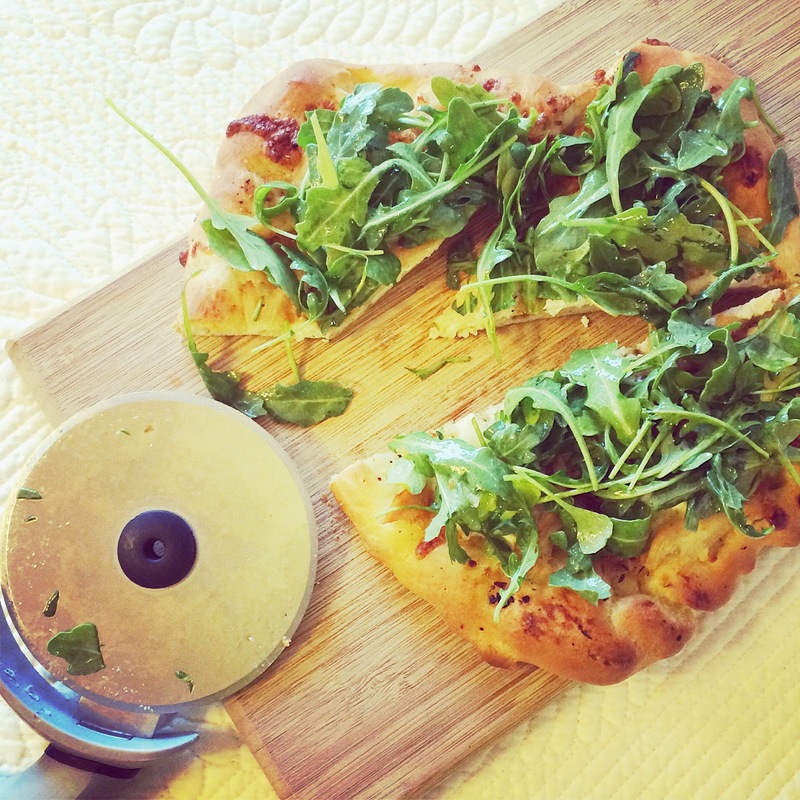 When the pizza is baking, mix together the arugula, olive oil, and fresh lemon juice. Once the pizza is out of the oven, place the salad on top of the pizza. To make this recipe even easier, just buy a premade pizza crust. It looks like there are a lot of steps, but it is actually pretty easy... John and I have made this recipe twice already, actually! Linking up for Delicious Dish Tuesday and Tuesday's Table. I want to be besties with Martha! We would probably run in the same circle as Ina since they are both in the Hamptons. ha! Anyway, I love that pizza! We've tried it before but ya know, the husband says it's a girl's pizza. Whateverrrrr. Seriously so delish. Mouthwatering right now!! This is so good! Yum! Sounds delish! Thanks for the recipe! That crust looks beyond amazing! I love watching Ina on TV, what a good cookbook to have! I love homemade pizza! This sounds easy and delish! Oh my goodness that looks so delicious! I can't wait to try this recipe out! This sounds yummy! I love arugula pizza! mmm I want to come visit just so you can entertain me in your kitchen! haha You always make the best food! Pizza is my fav - and this looks ah-mazing!! Thanks for sharing this girl! Happy Tuesday! That looks amazing! Love me some arugula. Thanks for sharing girl! We've made a pretty similar pizza, but we usually add pears or apples. Yum! I've never met an Ina recipe that I didn't like...this looks delicious! I keep meaning to make my own pizzas - some day some day - this one looks tasty! Omg, this looks amazing! You can't go wrong with Ina! !